Discussion in 'Wii' started by Paulo, Nov 6, 2018. I'm new to the forum and to the portablizing scene and I'm hoping to build my first portable wii. First of all I dont know much about electronics, I've done some soldering before (changed the capacitors on a gamegear) and some other basic stuff but nothing as big as this project. I've seen the videos on the forum about electronics and read a lot of posts and my understanding on the matter is better but far from perfect. I have some questions (some are probably really noob questions) that I would like to understand before starting and hopefuly you can have the patience to teach me. I already bought a wii wich has a 6 layer board. 1 - 1.8v - If I understand correctly I need to connect both the purple 1.8v to each other, is any of the points inside the purple (picture below) ok to solder or do I need to solder to a specific point? Also, how do they work? Do I need a custom regulator to power them or are they powered by something else? 2 - The U10 Relocation - Is it performed the same way as a 4 layer board? Also just to make sure, I need to connect the u10 to any of the u10 vias in the picture below and not both, correct (picture below)? 3 - Custom Regulators Wiring - Again the same question as in the 1st one, is any of the points inside the colored spots ok to solder or does it need to be a specific one (picture below)? 4 - PTH08080 - I've seen multiple models of this converter, does it need to be a specific one or is any ok? 5 - Resistors for Custom Regulators - Do they need to be exactly the required resistance or is it ok if it is a bit up or down the value? Also, when buying them, what should I be aware of? Their resistance is obvious but I'm not sure about their other properties like their composition, power and tolerance. 6 - Bluetooth - Do I need to connect all the gnd pins to ground or is just one of them enough? Does the power come from the voltage regulator or is it from the board? 7 - Video - If I understand correctly a wire in the yellow (composite) should be enough to output video, correct? Again, does it need to be soldered to a specific point (picture below)? 8 - Audio - I pretend to use a amplifier board for sound, where should I solder the left and right audio wires? Is any of the red and white spots ok (picture below)? Also I would like to have a 3.5mm headphone input, Do i need to look for a amp board with the input or is that connection done somewere else? 9 - GC Controller - I'm thinking of using a gc+ board for this job, Can I connect both the 3.3v and 5v for rumble directly from the custom regulator? In the wii board I can only see vias for one port, is it possible to connect more than just one (picture below)? Also I read in the 6 layer guide that I need to wire a resistor in order to use safe mode, is it really necessary? 10 - MX Relocation - Do I need to connect all the 3.3v pins or just one? And the same question for gnd. Also do I need to remove the u10 and u9? I know I have to remove at least one of them for the u5 swap but can I leave the other one? Also, do I need to relocate the components that limit the current coming from the battery (the one in the picture below)? 11 - Case - I dont have a 3d printer so I was thinking of doing the project in a wii u gamepad shell. I know it is possible but is it too much for a first portable? 12 - Screen - Any recomendation for screens? If I go for the wii u gamepad shell it should be a 6.2 inch screen. 13 - Speakers - If I do the project in the gamepad, I was thinking in a wii u gamepad speakers but I couldnt find any specifications on them so I'm not sure if they will work properly with a amplifier board. What are your thoughts on this? 14 - Rumble - Should I go for a specific motor for the rumble or for example a 360 controller rumble works? 15 - Anything else that you think I should be aware of? 16 - When is the store coming back? I'm curious to see what products are avaliable. I really apreciate any help that you can give and I apologise for so many and probably noob questions. I just want to make sure I got the trimming guide right and that I have a better understanding before I dive in. In the end of my project and if everything works I will try to make a detailed tutorial on all the steps I made and all the materials used with links to help out new portabilizers like me and give a better understanding on basic questions like mine. AwesomeMe and Cpbaus like this. 1. The black chip on the left is a 1.8v linear regulator, so you can just connect those points together and you're good. 2. yes, u10 is the same, and yes, any should be good. 3. For all other voltages you can simply provide power to any labeled point and you're good, the 1.8v is the only one not connected together inside the board, which is why it needs the jumper wire. 5. It doesn't have to be exact, but very close. If you are off, it's better to be a little below what you need. 7. composite is enough for composite video, if you want higher quality you will need to use those lines instead. 9. You can connect directly to the regs yeah, you don't need the resistor, and there are 4 vias labeled 1-4 for players 1-4. 10. Just one is fine, they are connected together on the bit of board you cut out. You should go ahead and remove U9 as well as U10. You should use the current limiter so the battery doesn't die extremely quickly. 13. The Wii U gamepad speakers are a little tinny but they will work just fine with amps. IIRC, they are either 4 or 8 ohm. 14. 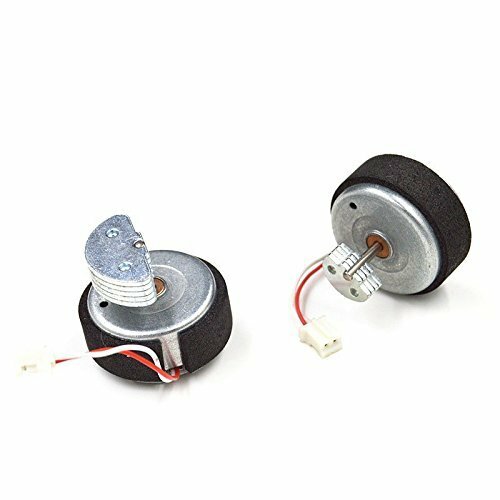 Any rumble motor should work as long as it is a 2 wire configuration. They usually look like this. 16. Store should be back soon, Noah and the staff have been working on getting stuff ready to get it open. BocuD, Shank and GingerOfOz like this. @cheese I was looking in the BOM for a 6.2inch screen and there was only one and they don't sell it anymore. My question here is the input voltage. The driver says 12v input but the screen says 3.3v input. Will it work if i power the driver with 3.3v from the custom reg? It won't work if you power it from 3.3v directly but almost all displays can be modified to run on 5 or 3.3v. cheese and Paulo like this. Just to make sure, is the MX chip trim in the 6 layer the same as the 4 layer? Do I cut in the same design? Also, if I got it right, to prevent the chip from drawing too much power I have to Wire it to the B+ pad instead of the pin 13? Or is it directly to the pin 13? I didn't get that part very well and I dont want the battery to die quickly. I'm not using OMTWTF trim, just want to use original wii motherboard. But I made a stupid mistake when trying to cut off 4 Gamecube port (to make my motherboard slimer), I aslo cut off the data tranfer line of USB ports Now I've to wire an external USB port, but still can get any of them to work (still work well before trimming). So anybody can post some picture to guide me how to wire external USB port to wii motherboard? P/s: Is CM1 (line 6-7 in OMGWTF guide) refer to USB port 1? The trimming guide has the information you're looking for. If you're unable to wire to the CM component, you can wire to the vias (shown in the guide). But you should definitely use some IPA on that board first. It's looking nasty! Some flux would probably help you out too. Be sure to use magnet wire to make your life easier, and to tightly twist the data wires. Also remember you need to power the port. I think I've got it all wrong. Is the B+ pad a soldering point for an external battery? Like the CR2032 that was in the wii? I don't want to be a pain or anything but I could really use a guidance here. I think I've looked everywere for an answer but I couldn't find any. yes, it goes to the slot where the CR2032 would be. Make sure to put the current limiter between the battery and MX chip. Is it the components inside the blue circle on the MX relocation picture? If so how is the wiring done? This is probably a easy question but I'm lost here. 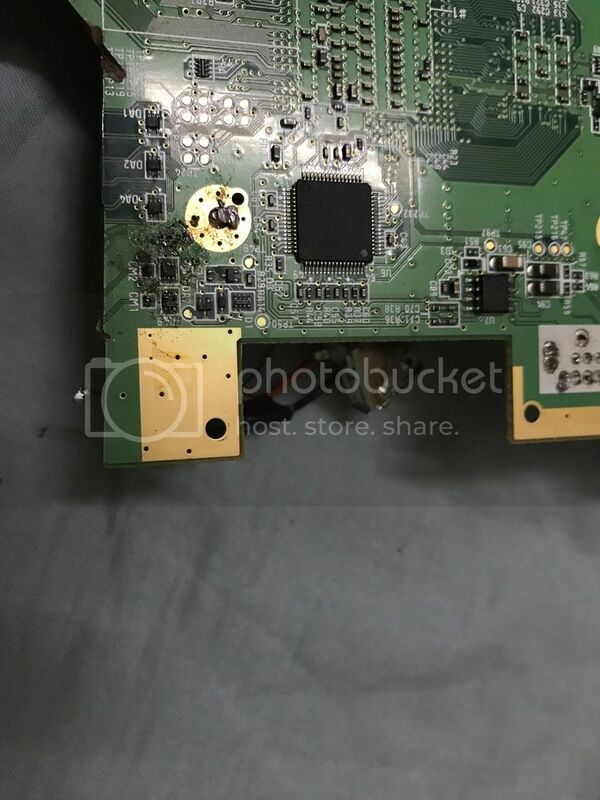 Looking at the picture it looks like the b+ pad is is directly connected to those components. I'm not understanting how the power from the cr2032 goes to the MX chip. With the cr2032 do I still need to power the MX chip from the custom reg on its pins? Or is it powered only by the cr2032? Yep those three parts are used. Power comes in along the B+ line directly from the CR2032 battery, and then it goes through the resistor at the top for current limiting, the diode in the middle to prevent blowing the MX by putting the battery in backwards, and then a capacitor to smooth the resulting voltage. In that picture, TP116 is directly connected to the MX chip. All of this is specifically to hold the date and time. Yes! That makes so much sense! But are the B+ pad, resistor, diode and capacitor and finaly the mx chip already pre-connected through traces or do I need to connect them myself? Because when you answered "Make sure to put the current limiter between the battery and MX chip" sounded like I had to do the connection myself and not just solder the battery + terminal to the b+ pad. I think I've seen a video on YouTube by @Madmorda on her worklogs and if I remeber correctly she had an MX chip with a battery wired. @Madmorda could you please confirm if I can wire the battery directly to the B+ pad? Also, I have a 6 layer board wich has a slight different layout of the MX chip. Are the protection components still the same as in the 6 layer? The same components are there but since their layout is a little different I'm not sure if they are all connected to power the MX chip.